Top brands that produce Wheel Bearing: BOSCH, STARK, SACHS, SKF, VAN WEZEL, VALEO, LuK, MAPCO, A.B.S., ATE. AutoDoc App — download the app and purchase car parts when and where you want! We hope this video has been helpful to you. Click “I like this”, subscribe to our channel and follow the updates. All the fun is ahead! Why not grease the inside of the hub and the new bearing for install? 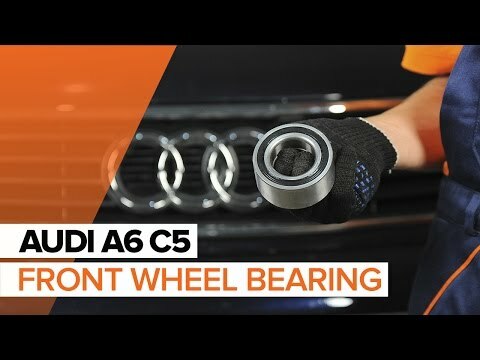 As it turns out, the bearing on my Audi A6 petrol 2.6 1996 has only ONE Correct direction for mounting. The inner diameter and the outer diameter is different and therefore the bearing has only one correct way to enter. I have just changed bearing on my Octavia which has the same inner diameter all the way. And when removing the wheel spindle, the inner part of the bearing normally splits in half (making it difficult to identify the difference in height). Therefore I didn't pay enough attention and ended up mounting the bearing the wrong way. When pressing the wheel spindle back into the bearing, everything entered fine a little more than half way, and then it just stopped. After a while I found the reason. Therefore, please identify in the video that there (sometimes) is a Right direction and a Wrong direction for mounting the bearing. what yr Audi A6 was this. i have a 2003 and wanted to know if I have the bolted on bearing and hub or if I have to take spindle off like this? ?